These stunning blossoms are mixed with colors of the two most thought provoking things on earth-the sky and the clouds that inhabit it. 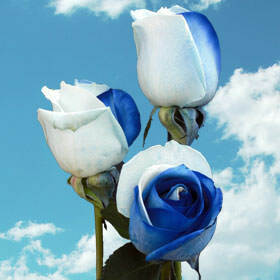 Our blue and white Rainbow Roses are nothing short of stunning. These buds exude a timeless beauty as the pure white and frosty blue bestowed upon their petals symbolizes purity, innocence, truth, and tranquility. Through our special dying technique we have combined two absolutely flawless colors, representing the most honorable of traits, to create these pristine buds that are sure to satisfy anytime of the year. They illuminate colors that are positive for any type of relationship or situation. Adorn a baby shower with them to celebrate the purity and innocence of the new life. Give a bouquet of these lovely blue and white rainbow florets to a friend, whom you admire and respect, to express how much you appreciate having them in your life. Grace your Fourth of July party with these festive blue and white blossoms, or treat yourself with a striking bouquet to bring tranquility and repose to your soul after a day of hard work. Summer parties, graduations, holiday parties, weddings; no matter what the occasion, our blue and white Rainbow Roses Wholesale are an exceptional choice. We grow our products all year round in the warmth of the South American sun, so you can relish in their beauty whenever you please. To ensure you receive the freshest blossoms possible, we cut them just days before they are delivered to your door, especially for you. All of our products take just 3-4 days to deliver, so please be sure to order accordingly. Please note that color tone for all flowers may vary due to monitor screen, or Mother Nature.